I thought it would be fun to introduce you to Bentley, My faithful Studio Assistant, since so many of you have e-mailed me asking about Bentley. He is a 3 year old Soft Coated Wheaten Terrier - an Irish breed sharing its ancestry with the Kerry Blue and Irish Terrier. The breed is affectionate and loving and are people dogs. 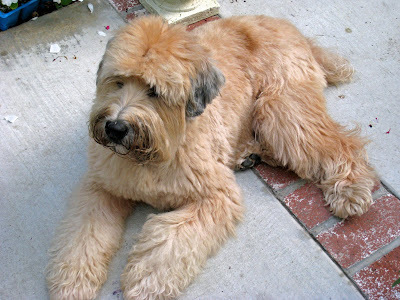 Wheatens are a single coated breed and do not shed. I adopted Bentley from the Soft Coated Wheaten Terrier Club of Southern California almost two years ago and he has been a joy from the moment I met him. The Wheaten club puts a lot of effort in matching the dog to the perspective owner or family and in educating the new owner. His owners put their Wheatens up for adoption since they were retiring to the desert and felt it would be too hot for them to be comfortable. I was fortunate to meet his owner who shared lots of helpful information about Bentley - the most important was that Bentley would rather sniff around and explore than play with his toys - hence his nickname - "Inspector Bentley". 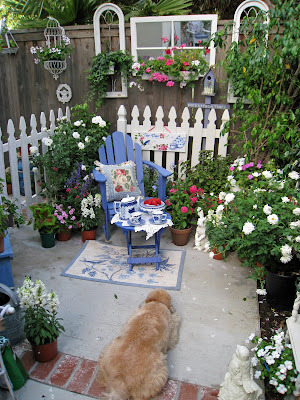 The following photos were taken as I was setting up my blue and white china for a photo shoot for the "Tea In The Rose Garden" painting shown in my previous post. Hmm, wonder what that is - looks like something to eat! I will just act like I am looking at the birds and no one will notice! The coast looks clear, think I will make my move! I will just take a quick sniff and no one will know! That was disappointing - just some strawberries and not a treat for me! Oh well , there are lots of other things to inspect! I'm so glad you stopped by. Thank you for visiting and for your kind comment. Sweet Bentley is adorable and looks right at home with your blue and white china! Your blog is lovely and as I was reading through, I had to say that I agree with your thoughts on simplifying for the new year. I decided to simplify as well. I enjoy living the simple life so much better. I seem to have more time for the important things in life when I'm not worrying so much about unimportant details. I'd love to add you to my favorites if you don't mind. Have a wonderful Sunday and God Bless! Bentley is so adorable Erin...that is wonderful that you have adopted him. How people can part with their dogs like that, I have no early idea...I'm a bit hard nosed about that concept as I guess you can see from my comment. Well you know I'm going to totally adore Bentley. I've had my Wheaton Crumpet for about 3 years now. I have asthma so I had to get a hypoallergenic breed. I love Wheaton's they are the sweetest most adorable dogs ever. I also have a mini schnauzer who is a lot of fun...but not quite so sweet lol. Bentley is a beauty! I'm going to enjoy your blog just to catch glimpses of him inspecting things! And it looks like you are really talented and will have lots of inspiration here too! Welcome to blogland...I hope you love it as much as I do. Bentley is adorable and I have a special spot in my heart for his name. We had a lovely Bentley too (a black Lab). Your artwork is vibrant and beautiful Erin. I've enjoyed my visit here. Oh Erin...Bently is adorable! What a darling face with so much expression. I'm an animal lover and have vowed to never "buy" another puppy/dog from a breeder, etc. There are too many that are up for adoption and need a forever home. I have one shelter dog and I think he knows we "rescued" him. I'm new to blogland and so happy that I found your blog. Your garden and paintings are stunning! I will be a regular visitor of your The Painted Garden. Thanks so much for sharing Bentley's story. He looks like a great assistant! Oh my goodness what beautiful photos. You did an amazing job creating that space. WOW! I am sure Bentley was a big help too.